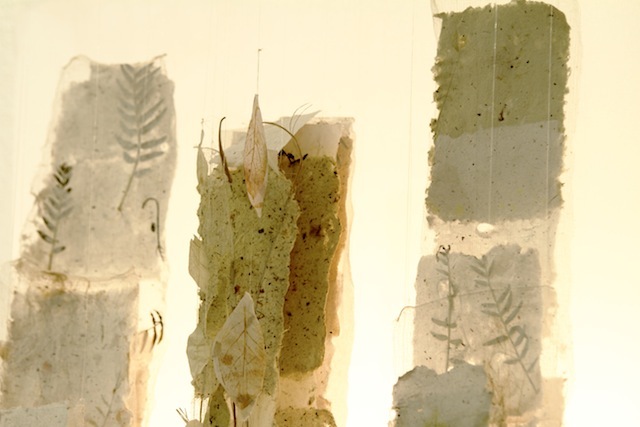 Hojas de Papel / Falling Leaves / Installation / Handmade Paper Piece. I wasn’t sure about the title so I’ve just put it all. 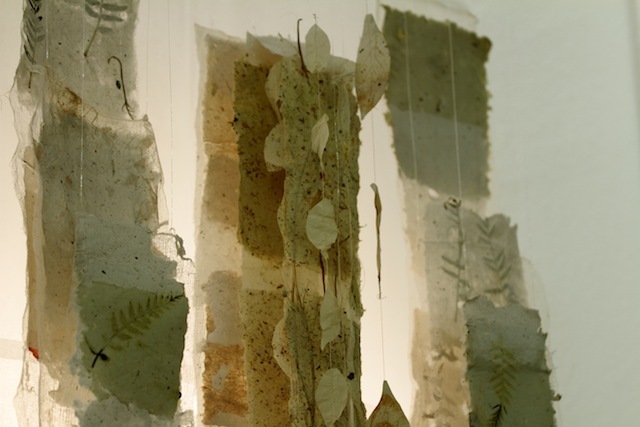 As a papermaker I often look at the leaves and flowers of a plant and wonder how they will react in the papermaking process in terms of texture, colour and fibres. 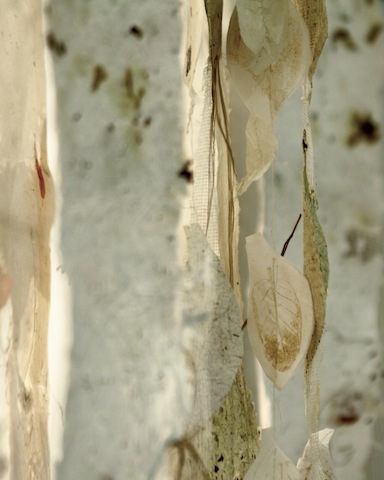 In papermaking every decision has it’s own unique effect on the resulting paper, as paper qualities and colour change so much depending on the plant’s state at the time of use. I can cook up a plant to make a 100% plant pulp or I can add it whole, crushed, dried, fresh or torn to my paper pulp. In the autumn last year I started inking up found leaves and running them through the press, taking their prints on my handmade papers. I wanted to show them, but I found a lot of the texture and the uneven, almost sculptural character of my handmade papers was lost whilst pulling them through the printing press and then putting them behind glass. 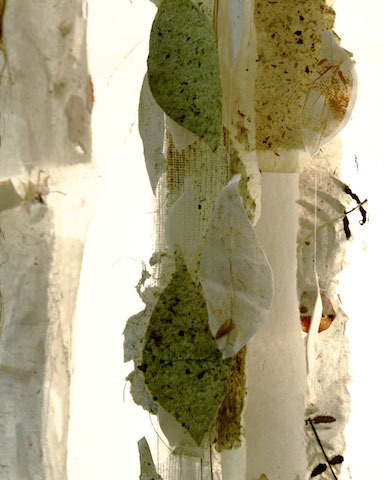 I made a hanging paper piece, pulling the paper directly onto scrim and Japanese papers to give some extra strength, and adding grasses and reeds, petals and plant pulps and fibres, dried avocado and false pepper tree leaves to my paper pulp which I naturally dyed and textured with mimosa blossom from my garden. 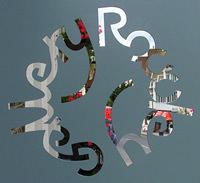 The piece measures approximately 1½ metres and has 3 panels. 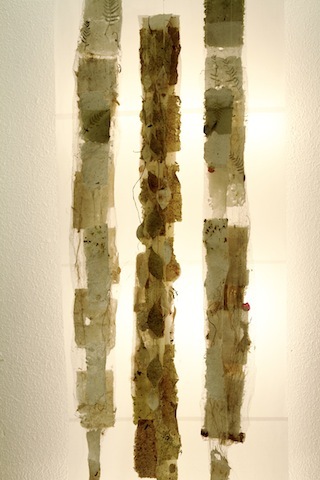 Each layer of each panel is hung separately by lengths of fishing wire from above, the printed leaves are hanging from cotton thread, and it is lit from behind. 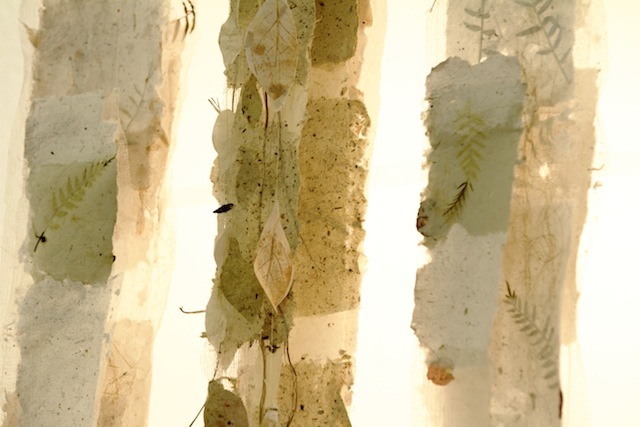 The backlighting highlights all the threads, fibres, plant details, texture and the delicacy of the paper, as well as showing up the layers and depth of the piece. Whilst appearing fragile, falling to just above floor level, this paper piece is in fact remarkably strong and enduring. PS: For another of Annabel’s leaves see this earlier post – Bewick’s Nature Print. 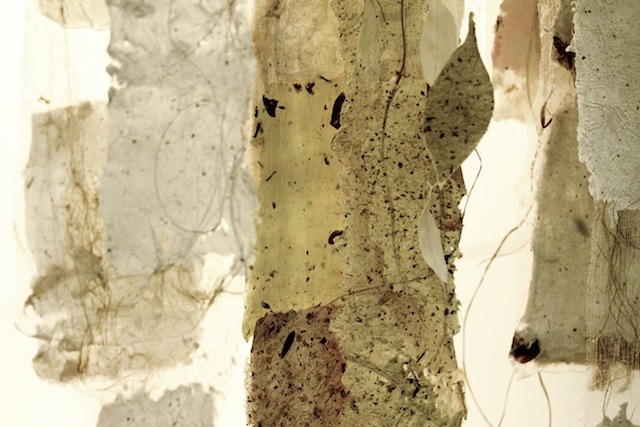 This entry was posted in Art, Textiles and tagged Annabel Keatley, handmade paper. Bookmark the permalink. What a beautiful piece of work. It’s as much to do with the landscape around you as the paintings and prints you make.